A Fayette County man has been sentenced to prison for possessing a shotgun as a felon. A judge has ordered 42-year old Kyle Boleyn to serve over fifteen years in prison. Boleyn had a warrant for his arrest when officers pulled over the car he was riding in on June 16th in Oelwein. He had seven prior felony convictions, including sexual abuse and manufacturing methamphetamine. 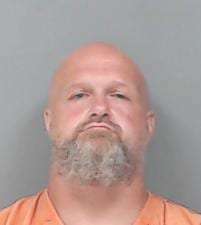 During the traffic stop, they found Boleyn with a shotgun, ammunition and a number of materials that Boleyn intended to use to make meth, including pseudophedrine and Coleman fuel. He pleaded guilty to being a felon in possession of a firearm and ammunition in June and was sentenced last week.